Your dive into the Mahamantra, and the results, were interesting. It was a good experiment but, frankly, not the best way to proceed. Taking an hour and expecting to be able to chant peacefully and deeply is a bit like trying to run a marathon after only jogging a mile a few times! Or trying to lift your weight with barbells without working up to it. My suggestion is this: First see how many rounds on the beads you can chant before your mind really rebels—then stop. Was it one, two, four rounds? Then start by chanting just that many. 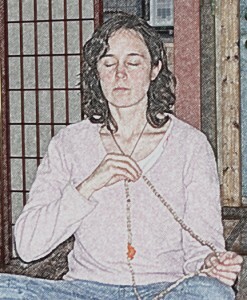 Of course you can chant other times too, like when walking somewhere, or standing in the grocery line, or singing while driving, etc., but I am speaking about chanting as a meditation on japa beads. Let’s say it was 2 rounds (maybe 12 minutes or so). So chant two rounds until you have no problem controlling the mind. If the mind wanders, pull it back. Focus on the chant. When you can do that easily, add a round. Eventually you can add more than one round at a time because there is a point where you have much more mind control than at first. Some buddhists smack those in meditation with a stick when they appear to have lost focus. You don’t have to do that, just pull the mind back take a deep breath and continue. Train the mind patiently, as you would train a child. In this culture, there is little attempt to control the mind. In fact, often the opposite is true. And if you talk about restricting sense enjoyment, people gasp. They think you are taking away your freedom. They do not understand that real freedom comes ONLY with the ability to control the senses and the mind. Each year one of the classes we give is on the hierarchy of our faculties. We’re been drawn into the world of the senses. The senses are out there roaming, constantly looking for something to focus on and become absorbed by. If you walk down a city street, you are pulled into what you see, smell, hear, etc. They are always roaming. Bhagavad-gita says that if the mind gets snared by even ONE sense, that sense can/will (if you allow it) throw off your consciousness. So the senses are always vying for your attention. They are begging the mind, “Let me eat this, smell that, feel that, etc.” It is the task of the intelligence to control the mind, or else the senses will control it. So when the intelligence controls the mind—once we are seasoned by the yogic path—the senses willingly tag along with the mind, instead of pulling it. And since the mind is more peaceful, the intelligence can be heard clearly. The intelligence is, in turn, guided by the practice of Bhakti, and so it then acts in your (the atma’s) best interest—instead of being dragged about by all the lower faculties. Have you ever seen The Dog Whisperer? He teaches that if you have a dog, you have to be the “pack leader.” I imagine you’ve seen people in your neighborhood out walking dogs, but really the dogs are walking them—pulling them along, stopping, straining on their leash. Clearly, the dog is in control. But if you become the pack leader to your dog, then he happily trots along with you. He doesn’t at all resent that he is not leading, he has found his place in the “pack.” Our senses and mind are like that. If we control the mind, by gently pulling it back, showing it that we are the “pack leader,” then eventually, the senses will tag along with the mind. And all are happy, because they weren’t really meant to be the boss anyway! The example about the Dog whisperer and the pack, is perfect!